Blade length :　78.8　cm or 31.02 inches. Sori :1.6 cm or 0.62 inches. Width at the hamachi : 2.23 cm or 0.87 inches. Width at the Kissaki : 1.65 cm or 0.64 inches. Kasane : cm or inches. Era : Meiji 29 year (1896). Shape : slightly narrow and thick long Katana. It reminds of Yamashiro. The Jigane is clear. Kinsuji. Boshi is Midarekomi style. for the Emperor Meiji in the next year. Sadakazu passed away in 1918, aged 73. Sadakazu’s second son, Sadakatsu was also a famous swordsmith. as Ningen-kokuho in the postwar Japan. as the difficulty increases to make it perfect. to making sword all his life. Everybody respected him for the nobility of his mind. on their meticulous attended tang to the file pattern. Saya : Black Roiro Saya with red color. Tsuba : Iron, dragon is engraved with gold color. Menuki : Dragon is engraved with gold color. From Aoi Art: Gassan Sadakazu is well known sword smith. 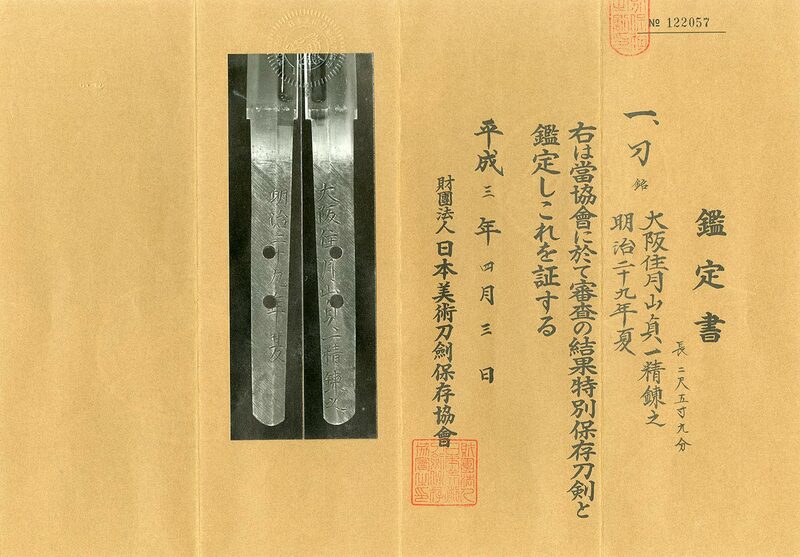 This blade is 78.8cm long Katana.